A new study suggests that dinosaurs may have been somewhat more fluffy than previously thought. To date, most illustrations of feathered dinosaurs have been analogous to modern, living birds, after all, the majority of scientists believe that birds are living dinosaurs and closely related to a group of Theropod dinosaurs (Maniraptora). However, in a paper published in the journal of the Palaeontological Association, a team of Bristol University researchers have revealed new details about feathered dinosaurs, allowing palaeoartists the chance to refine how these animals are depicted. It seems that dinosaurs may have been quite fluffy, a feathered Theropod dinosaur is one thing, but a fuzzy Velociraptor, that may take a little while to sink in. A clambering Anchiornis illustration with a drawing of the forked contour feather. The researchers, which included Dr Jakob Vinther (Bristol University), examined, at high resolution, an exceptionally well-preserved fossil of an Anchiornis (A. huxleyi) comparing its fossilised feathers to those of other dinosaurs and extinct birds. Anchiornis is known from numerous fossil specimens from north-eastern China (Liaoning Province). It is likely that the specimens hail from the Tiaojishan Formation of Upper Jurassic rocks and these fossils are estimated to be around 160 million years old. Where this crow-sized, four-winged creature sits (or should that be perches/or clambers), on the Dinosauria family tree remains open to debate. The fossils may precede Archaeopteryx by several million years and when first described Anchiornis (the name means “near bird”), was seen as a transitional form, very close to the split between dinosaurs and birds (Aves). Other studies have challenged this placement, with an affinity with the troodontids being proposed. Currently, the consensus seems to be that Anchiornis is a basal member of the Paraves clade, a part of the Maniraptora that incorporates the dromaeosaurids, the troodontids and the avialans, those dinosaurs that lead directly to birds as we know them today. The feathers around the body of Anchiornis, known as contour feathers, revealed a newly-described, extinct, primitive feather form consisting of a short quill with long, independent, flexible barbs erupting from the quill at low angles to form two vanes and a forked feather shape. The scientists conclude that the details of the contour fossils were preserved as some of these feathers became detached from the body during decomposition. When buried and fossilised, this taphonomy made the feather structure easier to analyse. Such feathers would have given Anchiornis a fluffy appearance relative to the streamlined bodies of modern flying birds, whose feathers have tightly-zipped vanes forming continuous surfaces. Anchiornis’s unzipped feathers might have affected the animal’s ability to control its temperature and repel water, possibly being less effective than the vanes of most modern feathers. This shaggy, fuzzy plumage would also have increased drag when Anchiornis took to the air. It was probably not capable of powered flight, most likely it was a glider, however, these contour feathers lacked the aerodynamic qualities of the feathers of extant birds. Anchiornis contour feathers (left) compared to a modern form of contour feather preserved in the fossil record. In addition, the wing feathers of Anchiornis lack the aerodynamic, asymmetrical qualities of modern flight feathers. This new study shows that the vanes on the feathers of Anchiornis were not so tightly “zipped” together when compared to those of modern birds. The feathers of Anchiornis would have provided little lift for the animal, so to compensate Paravians like Anchiornis packed many rows of long feathers into the wing, in contrast to extant, volant birds where most of the wing surface is formed by just one row of feathers. Anchiornis had four wings, feathers on the legs as well as the arms and elongated feathers on the tail. These structures would have increased the surface area of the animal assisting with gliding and helping to keep the animal stable in mid-air. 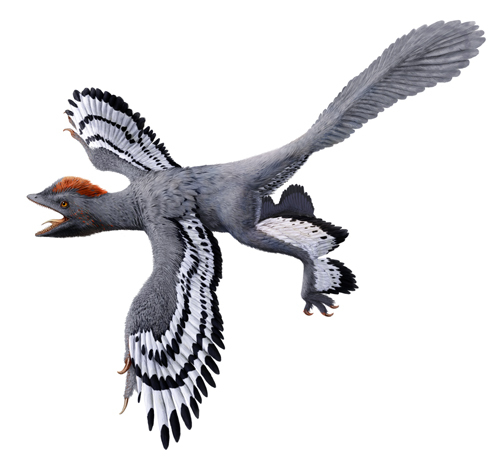 Scientific illustrator Rebecca Gelernter collaborated with researchers Evan Saitta and Dr Vinther, (University of Bristol’s School of Earth Sciences and School of Biological Sciences), to produce a life reconstruction of Anchiornis (see above). The colour patterns in Rebecca’s illustration are very similar to those in the earlier drawing produced by Julius Csotonyi, details of the feather pigmentation of Anchiornis had been revealed in a previous study, but this new illustration shows a more fuzzy, fluffy prehistoric animal. The fossilised remains of an Anchiornis (A. huxleyi). Everything Dinosaur acknowledges the assistance of a Bristol University press release in the compilation of this article. The scientific paper: “Additional Information on the Primitive Contour and Wing Feathering of Paravian Dinosaurs” by E. Saitta, R. Gelernter and J. Vinther published in Palaeontology, the journal of the Palaeontological Association. There are only twenty-seven days left before Christmas day, so, if you have not started already, time to start thinking about Christmas shopping, especially if you wish to send something overseas, a dinosaur themed gift for a relative abroad for example. In a bid to help our customers, Everything Dinosaur will be extending packing hours once again in the run up to Christmas and we will continue to pack and dispatch orders for customers as quickly as we can, even arranging for collections from our warehouse on Saturday mornings. We try to do all we can to ensure items ordered from Everything Dinosaur are sent out as quickly as possible. Last recommended posting dates for Christmas (Royal Mail). Please note these recommended last safe posting dates also to apply to our other international services such as tracked, signed and tracked and signed. Staff at Everything Dinosaur will do all they can to help customers and below is a list of helpful hints about the Christmas post. Please remember the dates listed above are guidelines only and they are the last recommended posting dates, as always, the best advice we can give is to post early for Christmas, in this way you are helping to ensure that parcels get there in time for the big day. 2). Check postcode/zip code details carefully. We do have our own automatic address checking software and we do all we can to check delivery addresses. 3). Before pressing the “submit” button to send an order to Everything Dinosaur, check the delivery address one last time, just to be sure. 4). Remember, with purchases from Everything Dinosaur, customers can write a message to us in the order message box. You can write in confirmation of delivery address or any specific, relevant information required to help ensure a rapid delivery. 5). If you want to specify a different delivery address to your billing address, our website allows you to do this easily and without any fuss or bother. 6). If you want to send an item to your work address, please ensure that you include the company name in the delivery address information. Once again, we will do all we can to check delivery addresses. 7). For deliveries in the UK, Royal mail are once again offering a helpful “deliver to your neighbour” service, if you let us know that the parcel can be left with a neighbour, this information will be added to the front of your parcel as part of our labelling procedures, remember to tell us the house number and we will make sure this information is put on the front of your parcel for you. A team of scientists based in South Korea have published a paper in the academic journal “Nature” that reports on the discovery of a Sauropod dinosaur footprint that has preserved the impression of the underside of the foot. The polygon-shaped scales on the underside of the long-necked dinosaur’s feet (plantar surface), would have provided grip and traction, helping these large creatures to traverse soft mud and slippery ground. Distinct skin impressions in a sauropod footprint (a) and on its cast (b) described in the study published in the journal “Nature”. The very distinctive foot impression and its cast, reported upon in this study, represent the largest known Sauropod footprint with skin details found to date. The single print measures more than fifty centimetres across. The footprint impression was left in silty mudstone as a large Sauropod crossed a mudflat in the late Early Cretaceous (Albian faunal stage of the Early Cretaceous). The researchers from Pukyong National University, Busan (South Korea) and Seoul National University (Seoul), describe a single footprint from the Lower Cretaceous Haman Formation discovered in south-eastern South Korea, they suggest that the floodplain sediments were formed by sheetflood processes, where shallow water moves relatively slowly across slightly sloping ground. The palaeoenvironment is interpreted as being a semi-arid area with lakes and ponds which was occasionally subjected to wetter weather, resulting in some flooding. Microbial mats formed across the low-lying ground, adjacent to the water sources and the presence of these microbial mats may have helped with the preservation of the foot details. Reconstruction of the plantar surface (underside) of a Sauropod foot with polygonal skin. The researchers conclude that some Sauropods by the late Early Cretaceous had a well-developed polygonal skin texture covering nearly the whole of their foot pads. This foot pattern is reminiscent to that found on the pads of extant elephants. These scales would have helped increase stability when these large and heavy animals crossed wet ground. Time to focus on one of our favourite members of the once very diverse Proboscidea – Amebelodon (A. fricki). The Amebelodon genus is a member of a group of primitive proboscideans called Gomphotheres, a group that also gave rise to the modern elephants. Like other typical Gomphotheres, Amebelodon possessed two sets of tusks, two uppers (much like those found on modern, extant elephants), and two lowers that extended from the very front of the lower jaws. However, the lower tusks of Amebelodon were distinctive in that they were relatively long, slender and somewhat flattened. These lower tusks reminded the first palaeontologists to study the fossils of shovels, hence Amebelodon and its close relatives are often referred to as “shovel-tusked”. In 2016, Safari Ltd re-introduced an Amebelodon model into the “Wild Safari Prehistoric World” range. This replica was broadly similar to an earlier model that had been retired, but this figure was brought back with a new colour scheme. Another “shovel-tusked” Gomphothere that may or may not be closely related to Amebelodon is Platybelodon, the exact taxonomic relationship between these two types of prehistoric elephant remains controversial. A scale drawing of Amebelodon. There has long been an assumption that these lower tusks were actually used as shovels by the animal during feeding, presumably to scoop up water plants. An analysis of wear patterns on the tusks has shown that these teeth were most likely used in a variety of ways in addition to shovelling, including scraping bark from trees. It is likely that Amebelodon was a versatile browser (an animal that eats broad-leaved plants rather than grass), feeding in both wet and dry settings in a variety of ways. The length of the trunk is not known, but this elephant is usually depicted with a relatively short, broad trunk. Fossils of the species Amebelodon fricki have been found in Oregon, Colorado, Kansas and Nebraska. Further to a number or emails that we have received in recent days, we have posted up a scale drawing of Apatosaurus, specifically Apatosaurus ajax, the first species of Apatosaurus to be named and described by the American palaeontologist Othniel Charles Marsh (1877). Dinosaur model fans will recognise the fact that we have based our illustration on the highly popular Papo Young Apatosaurus dinosaur model that was added to the Papo “Dinosaures” range in 2015. 2015 was a special year for fans of diplodocids, as, following a systematic review, the genus Brontosaurus was resurrected. The Papo model has certainly proved to be a big hit amongst collectors and dinosaur fans. The first Apatosaurus fossils to be discovered were found close to the town of Morrison in Colorado (USA). Subsequently, fossil material assigned to the Apatosaurus genus has been found in Wyoming and Utah. Apatosaurus was one of the so-called “mega-herbivores” of the Upper Jurassic of western North America. A number of Sauropod fossils are associated with the Upper Jurassic sediments in this region, including Diplodocus, Brachiosaurus, Barosaurus, Haplocanthosaurus and Camarasaurus. Several different families of Sauropod have been identified and as a result, many palaeontologists regard the Morrison Formation fossil material as the high watermark for Jurassic Sauropoda diversity. How Big was Apatosaurus ajax? Everything Dinosaur team members estimate that Apatosaurus ajax grew to around 25 metres in length and would have measured between 3 and 4.6 metres high at the hips. Mass estimates indicate a body weight of around 30 tonnes. Size estimates do vary, for example acclaimed dinosaur expert and author Gregory S. Paul states that Apatosaurus ajax was around 23 metres long and considerably lighter at approximately 20 tonnes. Today, Everything Dinosaur reveals the last of the new for 2018 CollectA prehistoric animal models and they are all dinosaurs. With the reassessment of the diplodocids back in 2015, the genus name Brontosaurus was resurrected and “thunder lizard” comes back with a bang with the introduction of a Brontosaurus model into the CollectA Prehistoric Life model range. Eagle-eyed collectors will note that the whip-like tail has been retained but there are rows of prominent scales depicted on this finely detailed figure. This is a very up-to-date replica of a dinosaur first named and described back in 1879. 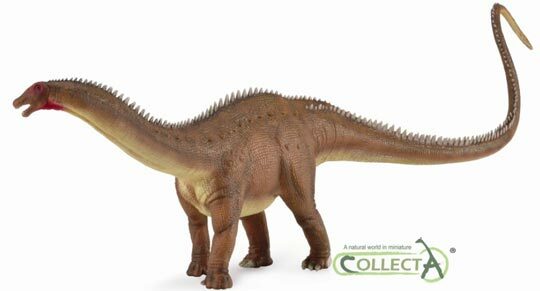 Our congratulations to CollectA, they have excelled themselves in creating a model of Brontosaurus excelsus. Next up, is a wonderful CollectA Deluxe roaring T. rex figure. A fine accompaniment to the 1:40 scale feathered T. rex that was introduced into the Deluxe range in late 2015, just a few weeks after the scientific paper that led to the re-establishment of Brontosaurus. This dinosaur has an articulated lower jaw and will prove popular, no doubt, with those model collectors who prefer their dinosaur figures to be provided without a base. This replica has fewer feathers than shown previously on other CollectA tyrannosaurid models. This version of an adult Tyrannosaurus rex roaring incorporates the latest ideas about adult dinosaurs having less plumage than previously imagined, after all, when you weigh in excess of seven tonnes, retaining body heat is much less of a problem! The last of the new for 2018 model introductions from CollectA is another giant, predatory dinosaur, although one not closely related to the Tyrannosauridae and a dinosaur that lived more than thirty million years before T. rex evolved. Mapusaurus was a member of the Carcharodontosauridae and it was closely related to another South American giant Giganotosaurus. Anthony Beeson explained to Everything Dinosaur, that this Deluxe model had been given a different colour scheme from the other Mapusaurus figure made by CollectA, this new colour scheme had been requested by dinosaur model fans. CollectA Deluxe Mapusaurus dinosaur model. This beautifully proportioned Mapusaurus (M. roseae) comes complete with an articulated jaw and it is great to see more large Theropods added to the CollectA Deluxe range, joining the likes of Neovenator, Acrocanthosaurus, Torvosaurus and Carcharodontosaurus. This new for 2018 Mapusaurus figure sports a fringe of brightly coloured large scales running along the underside of the lower jaw. This feature on the model has been inspired by the dewlap – a flap of skin that hangs down from the jaw and neck, a feature found in many modern lizards, for example. The dewlap of iguanas has a number of functions and in males the dewlap is often larger and more prominent than in females. The fringe of scales play an important role in signalling and communication between individuals. It is likely that many of the Dinosauria had similar features too and these played an important part in visual communication. As for when these models will be available, we expect them to be available from Everything Dinosaur around the middle of next year, could be earlier, could be later, we will update readers when we have more information. All in one location, here are links to the three other blog posts that provide information on new prehistoric animal models from CollectA in 2018. Birds and alligators might look very different, but they are related, belonging to the Archosauria clade, that diverse and extensive group of diapsids that dominated life on Earth during the Mesozoic. There are a number of groups of reptiles that are more closely related to birds than alligators, for instance there is the Dinosauria. At least dinosaurs and birds belong to the same sub-clade of the Archosaurs (the Avemetatarsalia), whereas, in contrast, alligators and their crocodilian cousins are placed in the other major sub-clade of the Archosaurs – the Crurotarsi. A team of scientists based at the University of Southern California have shed light on the evolutionary process that led to the development of feathers from reptilian scales. The manipulation of genes in embryonic alligator skin and developing chicks has enabled the researchers to replicate the evolutionary process that led to the development of primitive feathers within members of the Archosauria. Numerous Feathered Dinosaur Have Been Described – But How Did Feathers Evolve? A new feathered dinosaur from China, but how did feathers evolve from the scales of reptiles? Most scientists believe that feathers evolved primarily for insulation or display and that powered flight was secondary. Over the last two decades or so, there have been remarkable dinosaur fossil discoveries, mainly from the Cretaceous deposits in Liaoning Province (north-eastern China), that have revealed a myriad of different types of feathered dinosaur, but the mechanism for feather evolution was poorly understood. For example, many different types of feather-like structures have been identified in the fossil record, the famous Archaeopteryx (A. lithographica) from the Upper Jurassic limestone deposits of Solnhofen, Germany, has asymmetrical flight feathers, very similar to those found in living birds. These feathers are more complex than those seen in non-avian, non-volant dinosaurs of the Jehol Biota, that lived some 30 million years after Archaeopteryx was flying around. Excellent feather preservation. Asymmetrical feathers (flight feathers on the wings), whilst the hind limbs of Archaeopteryx had symmetrical feathers that probably played very little role in powered flight. What are Feathers and Reptile Scales Made Of? The feathers of birds and the scales of reptiles are essentially, made of the same protein – keratin. However, there are subtle differences in the composition of the keratin that makes up feathers and scales. It has been known for more than ten years, that the type of keratin that forms feathers is present in embryonic alligator scales. This form of feather-forming keratin, is suppressed by the expression of genetic information during the embryological development of the alligator, and as a result, as far as we at Everything Dinosaur know, the form of keratin that leads to feathers has not been detected within the dermal scales of adult crocodilians. The presence of this homologous keratin in both chicks and alligators suggests that this trait was inherited from a common ancestor, a member of the Archosaur clade (Archosauriformes), that existed prior to the evolution of the two basic types of Archosaur based on their ankle bones (Avemetatarsalia and the Crurotarsi). A team of scientists, led by researchers from the University of Southern California have started to unravel the genetic mechanisms that dictate how the outer skin and related tissues of living Archosaurs is formed. They have been able to focus in on the variety of genes that are involved in scale and feather development. The scientific paper detailing this research has been published in the academic journal “Molecular Biology and Evolution”. In this study, the scientists first mapped the genes of developing chicks and embryonic alligators to identify the differences in gene expression between the two Archosaurs and to pin-point the key genes involved in the formation of feathers or scales. Once this phase of the research had been concluded, the team then placed the genes associated with feather development in chicks into alligator eggs to see if the alligator genes for scales could be overridden by switching on the chicken feather genes. Normal embryonic alligator scales (left) compared with the elongated feather-like appendage following genetic manipulation of the alligator scales (right). In addition, the gene replacement led to the identification of several intermediate types of shape from scales to more complex forms of filamentous feathers. Some of the shapes identified resemble the filamentous appendages associated with feathered dinosaur fossils, whilst other shapes formed have similar characteristics to those found in the feathers of modern birds. This research has provided a further insight into how a new organ might evolve and has significantly increased the list of genes and molecules known to influence feather development. It has also highlighted the growing role of developmental biology and genetic mapping when it comes to interpreting the fossil record. The scientific paper: “Multiple Regulatory Modules are Required for Scale-to-Feather Conversion” by Ping Wu Jie Yan Yung-Chih Lai Chen Siang Ng Ang Li Xueyuan Jiang Ruth Elsey Randall Widelitz Ruchi Bajpai Wen-Hsiung Li Cheng-Ming Chuong and published in the journal of Molecular Biology and Evolution. Around four years ago, Everything Dinosaur was contacted by customer requesting advice on suitable models to help populate a prehistoric landscape that was being constructed. Dad Paul, was keen to acquire a number of prehistoric animal figures that worked well together in terms of approximate scaling, so that his son, Luke, could learn about the sizes of different dinosaurs through his creative play. At the time, some pictures of the finished dinosaur diorama were sent through to us, however, they were lost in cyberspace and we never got to see the fruits of Paul’s labour. Recently, we were contacted again, Paul is about to embark on a second prehistoric landscape project, this time for his youngest son Raef. Once again, Everything Dinosaur was able to provide advice about suitable models, Paul wanted to add a seascape, so further assistance was required, but this time the focus was on marine reptiles. He very kindly sent over pictures of his original diorama, complete with working volcano and other amazing special effects. An overview of the superb dinosaur and prehistoric animal landscape. The pictures sent into Everything Dinosaur include some of the wonderful models that were around four years ago. Sadly, a number of these figures have been retired and are no longer available. It is great to see favourites from Schleich and CollectA featured in the images. Horned dinosaurs come to drink against the backdrop of a volcano. “The volcano has a smoke channel (old hosepipe and a smoke machine), a lava injector (intravenous giving set), plus an incendiary fountain chamber created by placing a sparkler fountain in a tin can”. Smoke coming out of a crater close to the volcano. What a fantastic landscape! We are always eager to see how the prehistoric animal models that we supply are used and some of the landscapes and dioramas that our customers make are amazing. Our thanks to Paul and his family for sharing these pictures. Paul is not finished with his model making. Raef will be getting his own prehistoric themed play set very soon. This will be an additional dinosaur landscape, this time a mixed land and sea diorama that will also include a cliff-face for the resident Pterosaurs. Exciting news! Paul has promised to send in pictures of his completed prehistoric scenery in the New Year, we are looking forward to seeing his new dinosaur themed landscape in 2018. Another day and another Pterosaur fact sheet is being prepared by Everything Dinosaur team members. The flying reptile in question is Tupandactylus imperator, known from the famous Crato Formation in the Araripe Basin of north-eastern Brazil. Known from only four skulls and a fragmentary jawbone, discovered in commercial limestone quarries, this Pterosaur sported the largest crest of any known flying reptile. The head crests of the two species so far described (T. imperator and T. navigans) may have been different shapes. The head crest of Tupandactylus navigans was taller and more sail-like, whilst the crest of T. imperator was more swept back and broader. Both crests were huge, with the largest specimens of T. imperator having a head crest that makes up 5/6th the total lateral area of the skull. A scale drawing of the tapejarid Pterosaur Tupandactylus imperator. When described, back in 1997 (Campos and Kellner), the fossil material was assigned to the Tapejara genus, but subsequent, better preserved skull material showed enough anatomical differences to permit a new genus – Tupandactylus to be established in 2007. The genus name means “Tupan finger”, a reference to the god of thunder of the indigenous Tupi Indians of north-eastern Brazil. It may not be part of the Tapejara genus anymore, but it was closely related to Tapejara, although some palaeontologists, using what little stratigraphic evidence associated with the fossil material, suggest that Tupandactylus lived earlier in the Cretaceous than Tapejara (Tapejara wellnhoferi). Fossils of this flying reptile are associated with a lacustrine (lake), inland environment. A number of sources report that this Pterosaur ate fish (piscivore), although more recent research suggests that this Pterosaur may have feasted on a variety of foods and was probably omnivorous – feeding of fruit and seeds as well as small vertebrates.